Posted on January 14, 2011 by Jill B. The dreamGEAR booth at CES 2011 was one of those unexpected, pleasant surprises hidden among heavy hitters like Samsung, Blackberry, Canon, Intel, etc. The company truly boasted a product that no matter what kind of devices you own, you’d be silly not to add to your collection: meet the iSound Portable Power Max. 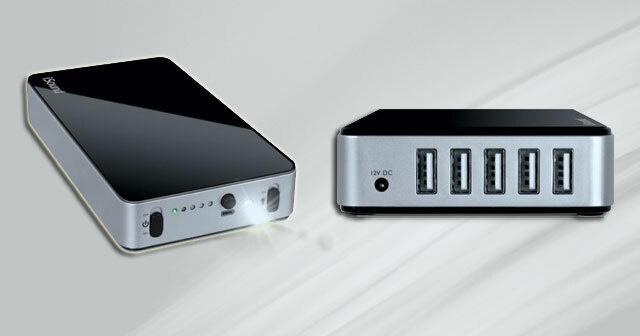 This power source gives 16,000 mAH of battery power and is equipped with five USB ports. It will juice your cameras, iPhones, iPods, iPads, Android, Blackberry and other USB devices simultaneously. This concept is handy considering we’re using more devices these days all at once. What’s most impressive about this USB backup battery is that it doesn’t operate like an ordinary outlet or charger. Its 16,000 milliamps mean that it doesn’t require constant recharging, which is often needed for data hungry, power-draining devices. The Portable Power Max is meant to give you 30 additional hours of power usage for the iPad, or three days of steady use. Your smartphone can also be boosted 11 to 16 times over. Other noteworthy features of the black and silver charger include an LED light that prompts you on the charging status and an AC/DC power adapter. The charger is also designed with a built-in flashlight at one end. We’re not quite sure to what capacity this feature comes into play other than charging devices in the dark. A USB cable with mini and micro connectors also supplements iSound’s Portable Power Max. It retails for $130, and you may be able to find it at a cheaper price on Amazon. The dreamGEAR iSound charger could prove to be vital in helping you stay connected traveling on the road or across the country. It appears to be so effective, that in all of its portable glory, you could leave it at home while traveling and still have enough power when you return. Think you’ll give it a try? What kind of battery power does your charger currently give you? Below, see the charger from all angles. We have an interview with Oren from dreamGEAR talking all about the features of the Portable Power Max as well as what the smaller version of the device can do. This entry was posted in Articles, CES 2011, dreamGEAR, iPad, iSound charger, iSound Portable Power Max, USB Devices and tagged 000 mAH, 000 mAH battery charger, 16, CES 2011, dreamGEAR, dreamGEAR iSound charger, i.Sound Portable Power, i.Sound Portable Power Max, i.Sound USB Portable Power Max battery, iSound charger, iSound Portable Power Max, Oren from dreamGEAR, Portable Power Max, USB Battery Charger. Bookmark the permalink. So cool. I need this! !